On garden flowers at Maanzoni, Machakos, Kenya. May 2017. The pale orange beak, or proboscis, is folded down and under the head. Assassin bugs are predatory on other insects (except a small group of blood suckers) which they capture with raptorial front legs and a mouth-beak that can inject paralyzing venom. Many hunt for prey on flowers. 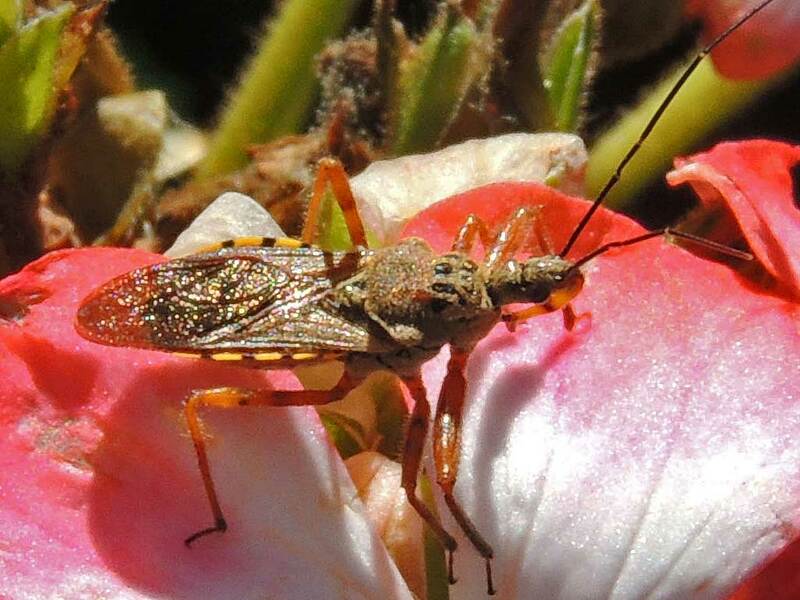 Flowers offer nectar and pollen as rewards for pollinators and many fall victim to an assassin bug in wait. Assassin bugs feed through piercing sucking moth parts, removing the liquid contents and leaving an empty skeleton-shell. Copyright Michael J. Plagens. Page created 25 Sept. 2017.